As HIV-infected individuals live longer thanks to antiretroviral (ARV) therapies, chronic liver disease is becoming a major issue. 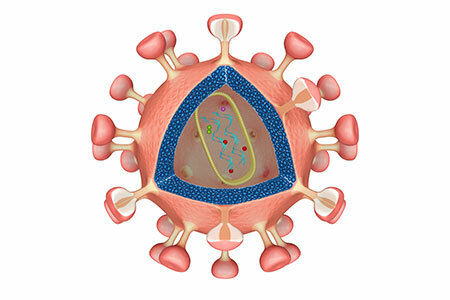 Research into HIV-and ARV-induced hepatotoxicity has been limited due to the lack of relevant preclinical models. A recent study by Dagur et al. describes a novel method for studying the human liver in the context HIV-1 infection, using a dual reconstituted humanized mouse model based on the TK-NOG1. Humanized mice are now considered a viable alterative to primate models in studying HIV infection2,3. Amongst these are CIEA NOG mice and NSG mice engrafted with human immune cells, including CD34+ hematopoietic stem cells (HSC) and peripheral blood mononuclear cells (PBMC). HSC-engrafted models have the advantage of stable, long-term engraftment, but, unlike PBMC-engrafted models, HSC-engrafted models are generally limited to T cell lineages. Each of these models can be productively infected with HIV-1 and have been widely used to study HIV viral dynamics and new ARV therapies3. An obvious limitation to these models is the absence of a human liver. Bone marrow/liver/thymus (BLT)-engrafted mice help to overcome this limitation; however, these animals are technically challenging to produce and interference with the native mouse liver can obscure the effects of engrafted human hepatocytes. The TK-NOG model allows for orthotopic transplantation of human hepatocytes into the mouse liver, while simultaneously ablating mouse hepatocytes due to a thymidine kinase transgene expressed under the mouse albumin promoter4. The TK-NOG has been used extensively to study human liver drug metabolism and toxicity. Additionally, TK-NOG mice can be engrafted with human HSCs to produce a dual reconstituted humanized liver/immune system mouse model. Dagur et al. used this dual reconstituted TK-NOG model to study how HIV-1 infection affected the human liver. They showed that chronic HIV-1 infection (16 weeks) induced hepatocyte damage in these dual reconstituted mice, but not in mono reconstituted mice, or in HIV-uninfected dual reconstituted mice. This effect was associated with a decrease in human albumin production, a proinflammatory milieu in the liver, and a decrease in liver CD4+ T cells. Thus, the TK-NOG offers a novel model to study HIV-induced human liver pathogenesis. While liver pathology has been described in patients living with unsuppressed viral loads, the advent of highly-active ARV and long-term viral suppression has largely replaced HIV-induced with drug-induced hepatotoxicity. This dual reconstituted TK-NOG model offers a model to simultaneously monitor ARV efficacy, along with human liver metabolism and toxicity, all within the context of HIV-1 infection and subsequent viral suppression. A related study recently reported the development of a novel NOG strain that also allows for human metabolism of ARV drugs. This model expresses the human drug metabolizing enzymes CYP3A4/7 and the nuclear receptors PXR and CAR in a NOG background5. The authors showed that this model recapitulated human specific ARV metabolism in the mouse liver, suggesting that this model might also help predict ARV metabolism and efficacy following HSC engraftment and HIV-1 infection. Humanized models are becoming more and more complex, and their application towards various therapeutic areas are becoming more nuanced. The introduction of novel NOG strains, such as TK-NOG, and the human cytokine expressing NOG-EXL (hGM-CSF/hIL-3), hIL-2 NOG, hIL-6 NOG and hIL-15 NOG are expanding the applications for humanized mice in the fields of infectious disease, immunology, immuno-oncology and drug development. 1. Dagur RS, Wang W, Cheng Y, Makarov E, Ganesan M, Suemizu H, Gebhart CL, Gorantla S, Osna N, Poluektova LY. Human hepatocyte depletion in the presence of HIV-1 infection in dual reconstituted humanized mice. Biol Open. 2018 Feb 13;7(2). pii: bio029785. 2. Watanabe S, Terashima K, Ohta S, Horibata S, Yajima M, Shiozawa Y, Dewan MZ, Yu Z, Ito M, Morio T, Shimizu N, Honda M, Yamamoto N. Hematopoietic stem cell-engrafted NOD/SCID/IL2Rgamma null mice develop human lymphoid systems and induce long-lasting HIV-1 infection with specific humoral immune responses. Blood. 2007 Jan 1;109(1):212-8. 3. Satou Y, Katsuya H, Fukuda A, Misawa N, Ito J, Uchiyama Y, Miyazato P, Islam S, Fassati A, Melamed A, Bangham CRM, Koyanagi Y, Sato K. Dynamics and mechanisms of clonal expansion of HIV-1-infected cells in a humanized mouse model. Sci Rep. 2017 Jul 31;7(1):6913. 4. Hasegawa M, Kawai K, Mitsui T, Taniguchi K, Monnai M, Wakui M, Ito M, Suematsu M, Peltz G, Nakamura M, Suemizu H. The reconstituted 'humanized liver' in TK-NOG mice is mature and functional. Biochem Biophys Res Commun. 2011 Feb 18;405(3):405-10. 5. McMillan JM, Cobb DA, Lin Z, Banoub MG, Dagur RS, Branch Woods AA, Wang W, Makarov E, Kocher T, Joshi PS, Quadros RM, Harms DW, Cohen SM, Gendelman HE, Gurumurthy CB, Gorantla S, Poluektova LY. Antiretroviral Drug Metabolism in Humanized PXR-CAR-CYP3A-NOG Mice. J Pharmacol Exp Ther. 2018 May;365(2):272-280.